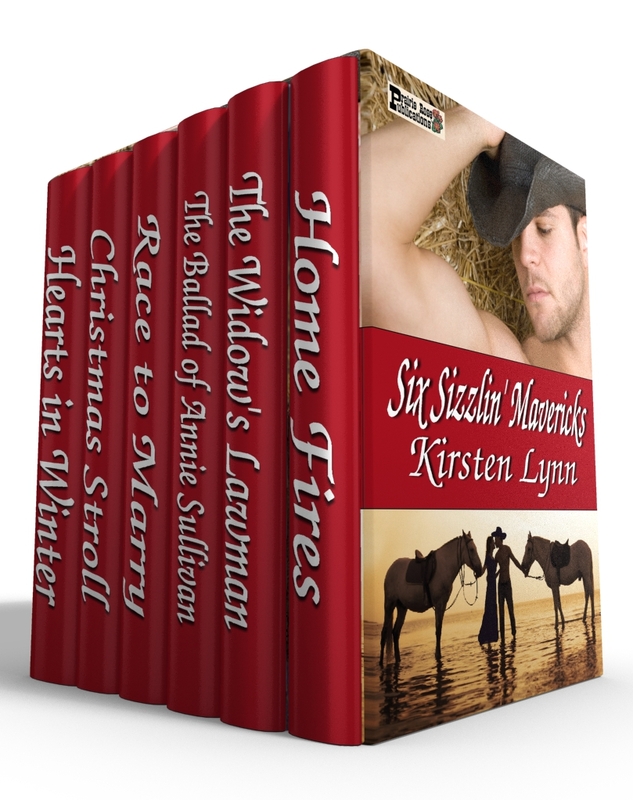 Make yourself comfortable in your favorite easy chair and grab yourself this special boxed set of Kirsten Lynn stories–SIX SIZZLIN’ MAVERICKS! These tales range from four short novellas to two full-length novels. Each one is a stand-alone story, introducing you to some of the toughest heroes, the most independent heroines, and of course—in Kirsten Lynn style—the hottest, most sizzlin’ love affairs a body could ask for! From the HOME FIRES of the Civil War to a hard-won RACE TO MARRY, you’ll love these tales of feisty ladies and rowdy men who know how to live and love to the fullest. The collection contains two Christmas tales, CHRISTMAS STROLL and HEARTS IN WINTER, which are sure to keep you wishing for a Wyoming snowfall and an old-time full-blown holiday of your very own. THE WIDOW’S LAWMAN and THE BALLAD OF ANNIE SULLIVAN round out this fantastic boxed set with a couple of tales that will keep you on the edge of your seat to the very last page. PRAIRIE ROSE PUBLICATIONS is proud to let loose these steamy tales of SIX SIZZLIN’ MAVERICKS, sure to provide you with hours of romantic reading enjoyment!